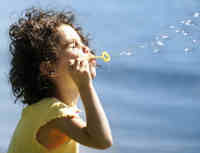 Summer wouldn't be summer without the chance to blow bubbles! Use our bubble recipe to make up your own batch of super bubble mixture. Store it in jars or bottles overnight for an even better mixture. Scroll down this page to find our bubble recipe. If you don't mind getting a bit soapy, you can blow surprisingly large bubbles by looping your thumb and first finger into a bubble blowing wand! Or loop some wire (garden wire works particularly well and is easy to loop) into home-made bubble wands. You can made huge wands out of wire coat-hangers, but adult supervision is required because the ends can be sharp. Pipe cleaners work too, but get soggy. Drinking straws make lots and lots of sweet little bubbles. If you have any scooby-doos in the house (the plastic strings used for making key fobs - not the cartoon dog! ), you can easily twist these into excellent, colourful bubble wands. With a bit of practice you can make 3 or even 4 loops from one scooby-doo string. Raid your kitchen drawers - look carefully and there are bound to be a few kitchen implements that have holes in them! Mix the ingredients together very carefully, so that you they don't get too bubbly. Pour into storage containers and, if possible, leave overnight to blend. Try catching a bubble on a wet finger, and then on a dry finger. What do you notice? It should be much easier if your finger is wet. Why? Add bubble bath to a plastic basin of water and whisk it up to create lots of small bubbles - or better still, give the kids a hand-held whisk and let them do it! Play with the bubbles. As above, but this time provide plastic toys and washable dolls as well as cloths, sponges, old scrubbing brushes and old toothbrushes. Have a good scrubbing and cleaning session - great fun. When my daughter was small there was nothing she liked more than splashing soapy water on the kitchen small and scrubbing it, whilst singing "It's a hard knock life" from the musical Annie. Really! Find some bubble wrap and pop bubbles! Or cut round shapes out of the bubble wrap and paint one side, then use them to make bubble prints on a large piece of paper. Make a bubbly bottle toy. Half fill a plastic bottle with water. Add some food colouring and a really good slug of liquid detergent. Paint some glue around the top of the bottle before screwing on the cap and leaving to dry (alternatively, tape the bottle shut with masking tape). Now shake!